Comparison tables are often used by affiliate marketers to compare products. Although they have disadvantages – chiefly that they don’t always display perfectly on the smaller screens of mobile devices – for many website owners, their advantages far outweigh their disadvantages. Comparison tables can be created with relatively little effort, but because they summarise the key details of individual products, such as technical data or prices at a glance, they offer significant added value and authority to your website. However, the creation of these tables can raise many questions, particularly for inexperienced site owners – the main ones being: which products do I compare in a comparison table, and which product details are important? 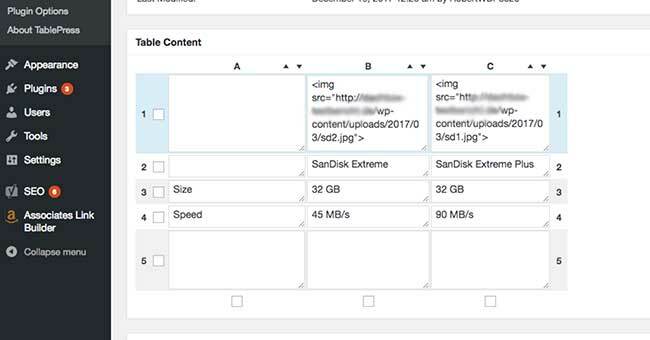 In the following article, we aim to answer these questions and more, as well as show you how to create a comparison table with free WordPress plug-ins. When shopping online, it’s not always easy to find important product details quickly, without having to study a product page relatively closely. Many visitors have no idea what’s important about a specific product, and don’t know which specific characteristics to look out for when considering a potential purchase. As a site owner, even if you write reviews of products and then only compare them with other products on the market that you haven’t yet tested, comparison tables are still a great way to outline these comparisons and create a market overview for a product. The more information about a product a customer has at their fingertips, the more quickly they’ll make a purchasing decision. You’d think, therefore, that the more product details you include in a comparison table, the more positive the impact on your conversion rate will be. However, when it comes to creating comparison tables, you should ensure that you only include the most important product details. Trivial information should not be listed under any circumstances, because it will result in a loss of clarity. Also, if you include too much information, it may prompt your visitors to re-evaluate their decision, which can also have a negative effect on your conversion rate. Potential customers always like to know what a product looks like. Price has a strong influence on any purchase decision. In the following example, our prospective buyer can go directly to Amazon.co.uk by clicking on the price. If they buy the product, you earn your advertising fee. 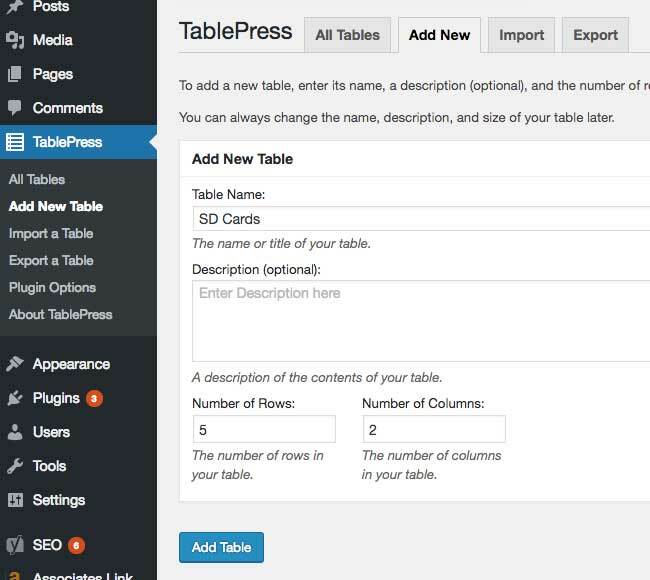 TablePress is a plug-in that makes it easy to create tables in WordPress with no programming skills – it’s a great solution for those with little or no website experience. Once you’ve created tables using the plug-in, they can easily be copied and then adapted. 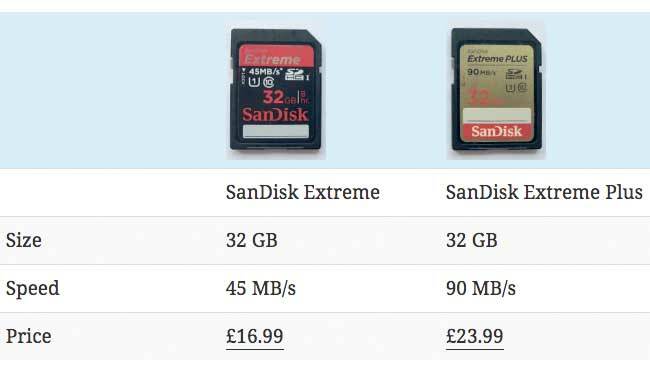 This is useful if you want to include several comparison tables with different products on your website. 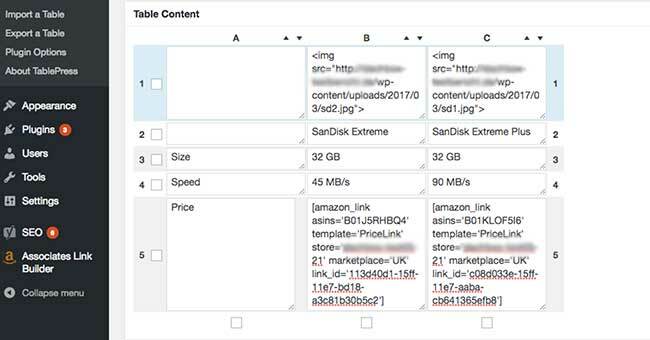 The Amazon Associates LinkBuilder plug-in can then be used to output current prices for the products in the comparison table. As you see in the picture above, our example table contains five lines for the product details. Likewise, we need three columns – one for each product. If you installed and activated the TablePress plug-in, the menu item ‘TablePress’ will appear in your WordPress menu. Click ‘New Table’, and then assign a name for the table – adding a description is optional. Under ‘Number Of Rows’, select 5, and under ‘Number Of Columns’, select 3. Click ‘Add Table’. You will then enter the Edit mode for your new table. In the field ‘Table Contents’, you’ll see your previously assigned rows and columns, which you can now fill with content. These individual boxes can be enlarged for a better view. In the cells of the first line, you can add images which are to be output later. We used homemade pictures of the SD cards we’re comparing. The pictures were created at a size of 100×140 pixels, and uploaded in advance to the WordPress Media Library. Now the Amazon Associates Link Builder comes into play. With this plug-in, we can include up-to-date prices of the products in the table output. We do this by using Shortcodes, which can be created quickly and easily with the plug-in from within your WordPress editor. Open a new post in a new tab. If you have installed and activated the plug-in, you will see a search box above the WordPress editor’s toolbar. Here, you can search directly in your WordPress editor by product name, or the ASIN (amazon Standard Identification Number) for a product, directly on Amazon. Just fill in the search field and click ‘Search’. A window will open and your search results will be displayed. If you’re looking for the product name, you will probably see several search results. When searching for the ASIN, only a single search result should appear. Select the product and then select the template ‘PriceLink’ from the ‘Ad Template’ drop-down menu. Then click ‘Add Shortcode’. Embedding your table in your website’s pages is made possible by using the TablePress Shortcode of the respective table. This is displayed slightly higher up the screen, in the Edit mode of the table. Copy the Shortcode you find here and insert it at the place in a Post or Page where the table is to be output. The table can also be output as many times as desired, and in different places on your website. A final note: tables created with TablePress are not automatically displayed responsively. This means that they won’t automatically resize depending on the device they’re being viewed on, and as a result, screen problems can occur on smaller screens. The free Extension ‘Responsive Tables’ solves this problem and can be downloaded here free of charge. The Extension is not a must, but is definitely recommended, because the use of internet on mobile devices continues to rise. We hope you’ve enjoyed this tutorial – now you know how the principle works, you can create a table with many more products.